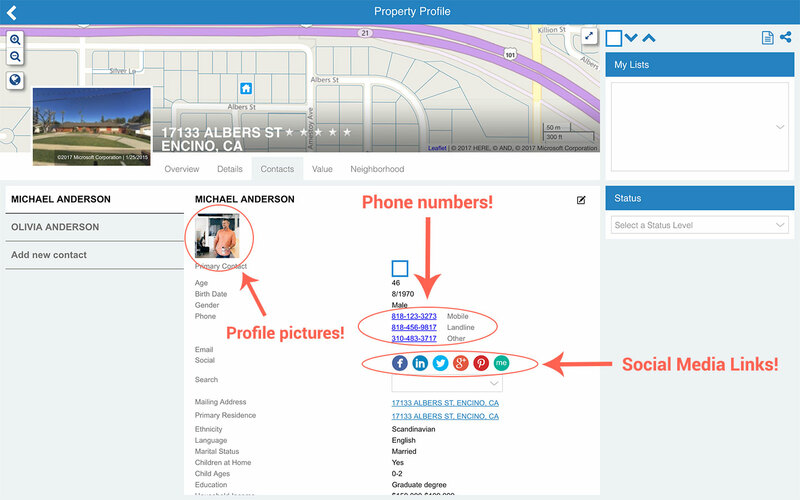 Phone numbers, social media profiles, rich demographic data, tabbed navigation for Property Profiles, editable contact fields, and more! 3.0 Known issues have been resolved with 3.0.2 hotfix on August 4, 2017. Read about it here. Q. I hate change! Why did you have to change the Property Profile? Change is hard for some people, and we get that. But being resistant to adapting to ever-changing market conditions and technology is a recipe for failure…for the both of us. We outgrew the old Property Profile. Why? More data. Our vision is to take the data that the very big companies can afford and have access to, and make it available to small, local businesses, like you. With all the incremental data we’ve added in this 3.0 release, as well as looking ahead at all the new data we intend to make available in future releases, we simply outgrew what the old Property Profile could accommodate. On average, 4 out of 5 customers surveyed preferred a tabbed navigation over a long scroll. And for good reason. From Facebook, to Google, to most of the current information/data-rich applications out there, the tabbed interface is standard. It’s simply the most efficient and understandable way of organizing lots of data and information. Keep in mind, with the new data, the scrolling page length would have doubled. With the data we’re looking at adding over the next year, maybe 3-4 times longer. We respect your time. Web and mobile app consistency. Finally, 5 out of 7 customers use PropertyRadar in the Web app and on their mobile device. For the last 18 months, we’ve worked to deliver a seamless and similar experience across both devices. 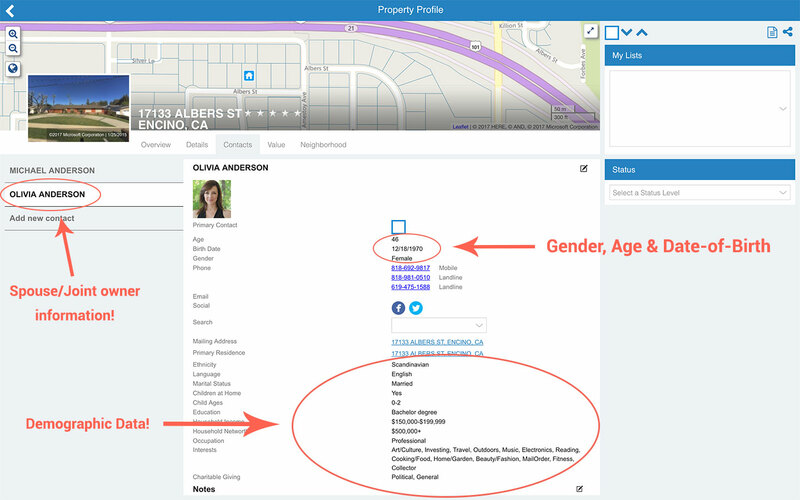 Again, all this new data presented a significant challenge for the old Property Profile in the Web app, but for the mobile apps, it was simply going to be unusable. Q. Holy smokes! All this Demographic Data is scary…why are you providing so much personal information? Our mission is to give small businesses the same access to all the same data that is widely available and already being used by big businesses. Yeah, it’s a lot. And, yeah, it’s scary. No, no one stole it from you. Yes, it was all legally collected. You likely gave it away in return for entering a survey, or one of your friends ratted you out when they uploaded their contact list in exchange for some free service. Chances are you’ve ratted your friends out too. About the only way to keep your personal info safe anymore, is to not share it with anyone, even Mom. Get rid of your smartphone. Never use any social media site, like Facebook or LinkedIn. Don’t shop on Amazon. Never click on an ad. We don’t necessarily like it ourselves, but it is the state of the world we currently live in. And we don’t think it’s fair to let the big guys continue to stomp out small businesses by being the only ones to have access to all this data. Once you fully realize how much additional data there is about you that large companies are taking advantage of every day, we hope you can see why we’re driven to make small, local businesses competitive. Q. How good is this demographic data? You’ll be surprised both how great it is, and by how bad it is. Keep in mind that we’re giving you the ability to view the data that other list providers only allow you to use as criteria. Companies pretty much source data in the same ways, and from the same sources. We’re confident that what we are providing is on par with the best in the industry. But there’s a big difference with other tools, in that we let you look under the hood and see the actual data used to create your list, rather than just giving you a list. Powerful, awesome, and honestly, often wrong. Keep in mind, the goal with this feature is not perfect data, it’s to help you better target market your most likely customers. Again, the big businesses are in the same boat and working with the same data. And yes, we’ll continue to source newer and better data, all the while improving our algorithms. Q. Will you have email addresses? We already have hundreds of millions of email addresses, and we use them to bring you stuff like social profiles and profile pictures. We’re still working on how to let you use email addresses to contact customers in a way that reasonably respects internet etiquette and Federal law. But yes, our vision is to make it easy for you to contact prospects by email. Stay tuned for information. Q. Can this demographic data be used in making lists? Q. 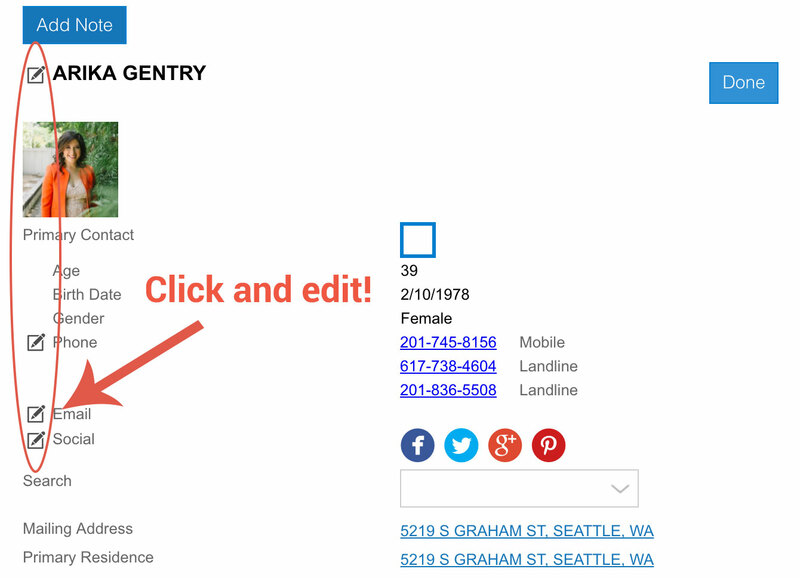 Can I export demographic data, like phone numbers and social media profiles? No. From the beginning, our goal has been to get users out of the import/export business. Exported data goes stale the moment you export – whereas we keep it fresh and tasty. More importantly, list sellers charge you per record, and often for each additional item of data you want. We hate this model! Instead, we give you unlimited access to all the records you can see, and we give you all the tools you need to import those lists. The one trade-off? Contractually, we can’t let you export all the goodness. If you need to buy phone numbers, or other data to import and manage in your enterprise software, we can’t help. If you want an all-in-one solution, where you never have to fix another CSV file in Microsoft™ Excel, we’ve got you covered. Q. I looked myself up and see my phone number and social media profiles. 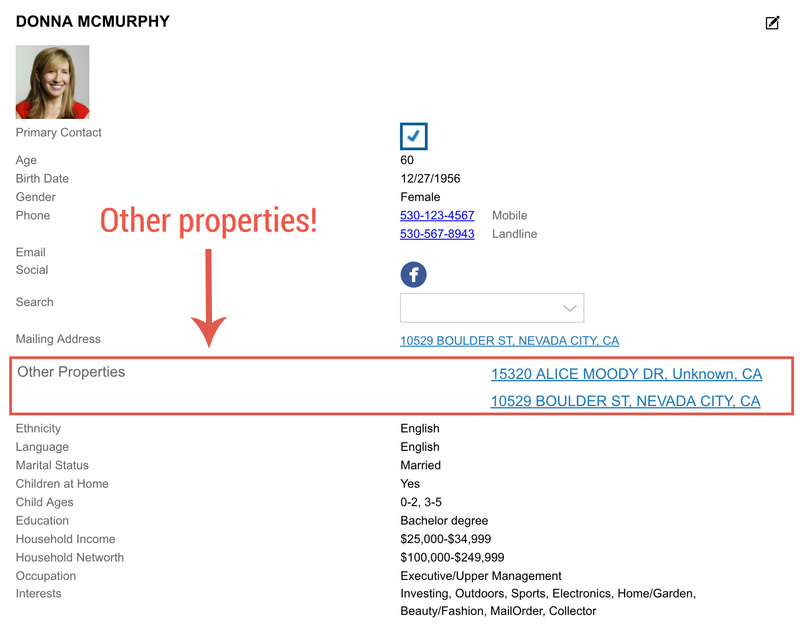 Will you remove me from PropertyRadar so other users can’t contact me by phone? Our mission is to give small businesses the same marketing opportunities as Big Business - and that means giving them access to the same data. If we have your number or social data, it means that thousands of other marketing companies do as well. Even if you ended up in a few of the hundreds of thousands of lists created by PropertyRadar users, the likelihood you would receive more than one call or Facebook friend request from another user of PropertyRadar is statistically insignificant. Unless your name is Taylor Swift. You are more apt to get a postcard. Unfortunately, for better or worse, this is now the world we live in. If you get a call from a number you don’t recognize, don’t answer it. You may be tempted to change your number, but if you give that phone number to anyone, it’s likely going to end up “in the wild” yet again. Once your Mom, spouse, children, or friends add it to their address book it’s only a matter of time before they unwittingly give it to a service that will once again resell it.